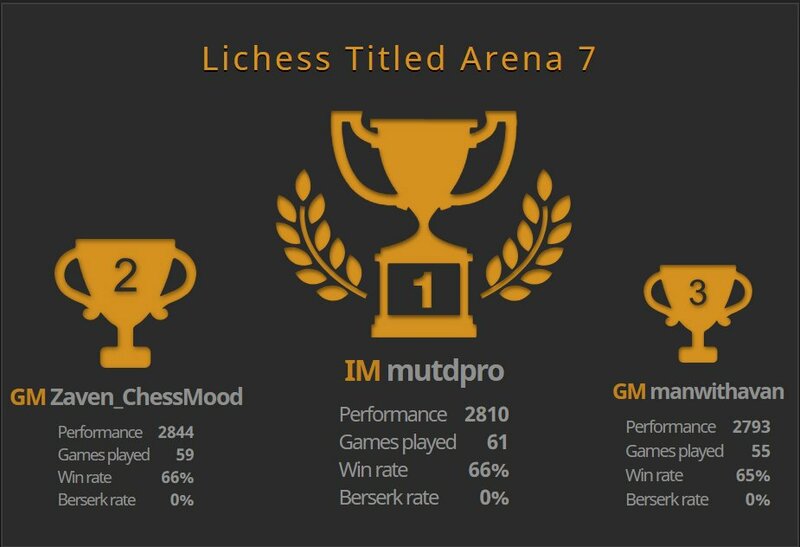 Vietnamese IM Minh Le (mutdpro) defeated a very strong field of 226 players to win the Lichess Titled Arena 7. Le opened up a lead of 10 points by the end of the tourney but the fighting for the final spots was fierce up until the final moments. Finishing second was Armenian GM Zaven Andriasian (Zaven_ChessMood) who had a very strong showing in his first Titled Arena. Finishing third was former Titled Arena Champion and current World Champion GM Magnus Carlsen, (ManWithAVan) who was running late and played the tournament from his phone . Streamers flocked to the event and many players streamed their play or just commentated the games that interested them. Commentary was given by ChessNetwork and FM Norbert Barth while streaming players included: IM Eric Rosen, GM Akshat Chandra, IM Mikhail Lushenkov[RU], IM Hans Niemann, FM Sylvain Ravot[FR], and Kingcrusher. At the beginning of the tournament Rosen very casually beat a still anonymous world champion.